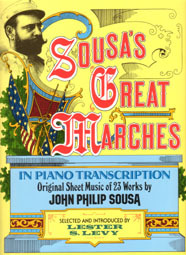 This book includes piano transcriptions of 23 works by John Philip Sousa. All are original or early edition reprints of sheet music from the collection of Lester S. Levy. All 23 works are marches so no lyrics are included except for one song edition of "Stars and Stripes Forever". PUBLIC DOMAIN STATUS: All works are reprints with original copyright date and publisher shown. Copyright dates range from 1886 through 1906. All the selections in this volume should be in the Public Domain in the United States. This may not apply in countries outside of the United States where copyright protection may exist.